Are you considering selling your home in the upcoming year? While searching for a new home is complicated enough, selling your current home is often a long and drawn-out process. One way to make the most of selling your home is to polish the features and aspects of the property that influence its resale value. With this, consider these four essential factors and the way in which they affect the value of your home as you sell. Although large homes with plenty of bedrooms were once the most appealing to families, the size of your home may be less important than its layout. With this in mind, your property size still carries significant influence, as families with children in pets may be in search of a big yard to enjoy as a family. Make the most of your home by showing off your space with staging, as well as a polished landscape that will be appealing to growing families. The layout of your home is arguably one of the most important influences on its resale value. Layouts such as open concept living spaces are especially appealing to homebuyers, as well as in-law suites, first-floor master suites, and finished basements. 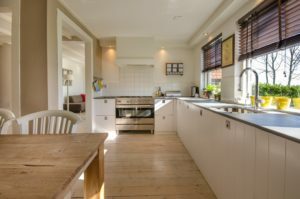 Consider the existing layout of your home and how you may be able to maximize your space with a design that will be most appealing to a potential homebuyer. The age of your home will also play a part in its resale value. Many homebuyers love older houses for their charm and history, while others prefer newer homes with modern features. No matter how old your home is when you sell, it is crucial to ensure that its features are updated and in excellent condition so that there are no potential issues as you sell. The condition of your home plays a crucial part in its resale value. Fixing up a home can be fun, however, most homebuyers prefer a home that is nearly move-in ready. Before you attempt to sell your home, be sure that features such as your lights, thermostat, and sinks are all in working condition. By preventing issues with your home before it is on the market, you may be able to sell it quicker with minimal setbacks. This entry was posted on Friday, November 9th, 2018	at 11:10 pm	and is filed under Residential Sales	. You can follow any responses to this entry through the RSS 2.0	feed. Both comments and pings are currently closed.